Congratulations—you’re engaged! And even though the last thing you want to think about is something bad happening to your diamond engagement ring, the possibility is always there. To protect your precious investment, it’s strongly recommended that you open a comprehensive insurance policy that covers your loose diamond. There are many options when it comes to insuring your engagement ring. Homeowner’s and renter’s insurance policies are usually the first sources of coverage considered by consumers, since most people already have one of these in place and assume it will be easy to add their diamond ring to the existing policy with only a negligible increase in their premiums. However, it’s important to note that homeowner’s and renter’s policies have certain limitations. While these types of policies will cover your diamond engagement ring if your house sustains damage as a result of a natural disaster, they are not likely to cover incidental damage to the ring from everyday accidents. Another option for covering your diamond ring is taking out an actual value policy. This type of policy first considers the purchase price of the ring and then subtracts a depreciation factor for each year that you own it. One potential drawback is that a claim received for your ring today most likely won’t be enough to purchase another ring of equal cut, color, clarity, and carat weight. A third and fourth option are a replacement policy, which replaces your original engagement ring with a ring of the exact same specifications, and a “valued at” policy, in which you select the appropriate monetary value of the ring and the insurance company honors the resulting figure regardless of its actual appraisal value. Since these types of policies offer the most benefit for a ring’s worth, these are typically the most expensive coverage plans. It is important to note that most insurance companies will require that you provide a gemological appraisal to verify the replacement value of your certified diamond. Each Brilliance product comes with a free gemological appraisal issued by a master gemologist. 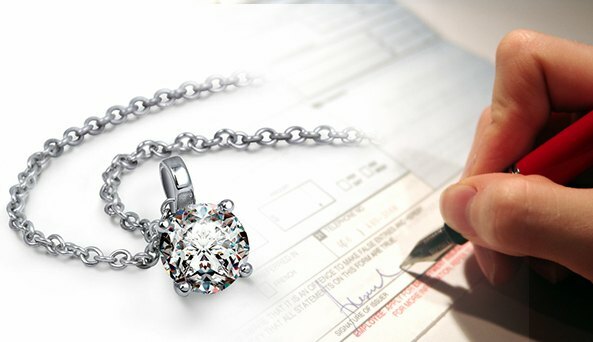 We also provide complimentary re-appraisals to adjust your item’s value as it appreciates over time. Is my ring covered in the instance of accidental loss, damage, or theft? Am I limited to a specific network of gemologists when replacing my engagement ring? Are there any circumstances under which my policy would not honor a claim? Must I have had the policy in place for a certain period of time or have paid a certain amount in premiums before any claims can be made against it? Remember, even a basic policy is better than nothing. You can always choose to upgrade later. With an insurance policy in place, you won’t be able to prevent mishaps, but you’ll be able to recoup some of your initial investment. For more information about purchasing an engagement ring and getting it insured, contact a Brilliance diamond and jewelry expert at 1-866-737-0754.